Let’s face it, laundry can be one of the least exciting duties at home. Doesn’t mean you can’t NAIL IT with a little know how! From treating banana stains to conquering static electricity in your tumble dryer, we’ve got it ALL COVERED with our 21 clever laundry hacks that’ll make you look like the laundry queen! When you know your way around stain removal, you feel like you’ve levelled up in the laundry game. Laundry hamper and elbow grease at the ready? Let’s do this. TRY NOT TO LET AN UNTREATED STAIN DRY ON FABRIC. Crayon stains can be removed with WD40. Spray, leave for 5 minutes, rub the stain with dishwashing liquid and water, spray well with stain remover and then wash. Ink stains can be shifted with a spritz with hairspray, rubbing it into the stain. Let it dry then treat with a stain remover spray. Wash in cold water. Grease stains can be treated by rubbing with chalk, baby powder or dishwashing liquid before spritzing with a stain remover spray and being washed on a regular cycle. Grass stains can be lightened by scrubbing with dish washing detergent and washed as per normal in warm water. Tomato sauce stains can be treated by tipping white vinegar directly onto the stain and washing immediately in cold water. Banana stains are among the worst so you MUST work quickly on those! Rinse the stain from the back of the fabric and then rub dishwashing detergent into it. Wash in a regular cycle and let dry in sunlight. Berry stains are best treated with the boiling water technique. Stretch the fabric over a bowl, the wrong side facing up and pour boiling water (use a kettle, pour from a height) through the stain to flush it. Once the stain is no longer visible, wash and hang in the sun to dry. If it’s a persistent stain, follow the water flush with a vinegar soak for an hour before rinsing and hanging out in the sun. Blood, vomit, pee and poop stains should be treated by soaking in cold water immediately. 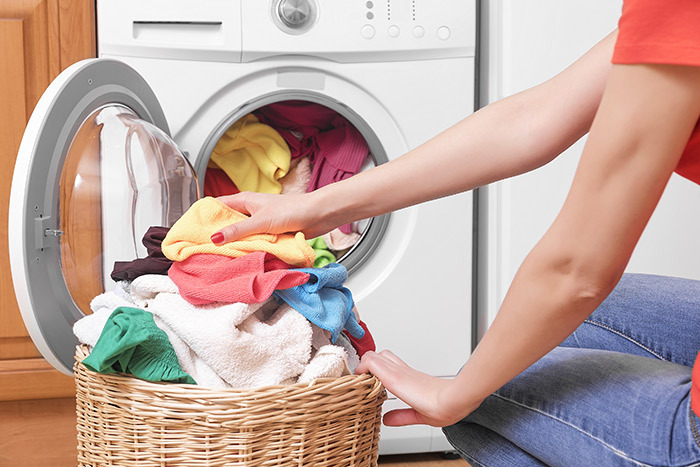 Follow through with a cold wash with a 1/2 cup hydrogen peroxide and 1/2 cup bicarb soda in the machine. Home made slime stains will be removed with vinegar in most cases. Pick as much of the kids slime away from the fabric as possible then douse the residual slime with white vinegar. The vinegar breaks down the slime, to which you can them scrub it away with a brush and rinse it off. Wash in a regular wash cycle and your shirt should be good as new. Sweat stains and deodorant build up are super annoying but before tossing out your favourite (albeit yellow stained) white tee, try scrubbing the armholes of the shirt. Use a mixture of 1 part dishwashing detergent and 2 parts hydrogen peroxide to the stain and then sprinkle with bicarb soda. Scrub with a brush then let sit for an hour before washing in the machine. TOP TIP: Take a look at what your most common stains are and create a stain removal caddy with the items you need at hand for quick stain treating. Keep it handy by the laundry sink! 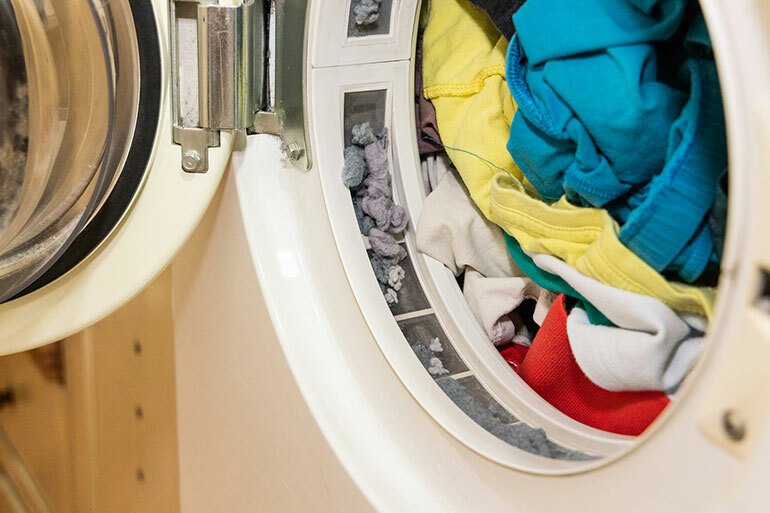 Who would have thought there could be hacks for your clothes dryer? Crumple up a ball of foil and add it to the dryer to combat static electricity build up. No longer reliant on the anti-static spray! Add a dry towel to a load of wet clothes to cut down on drying time. WINNING! Washed a tissue? 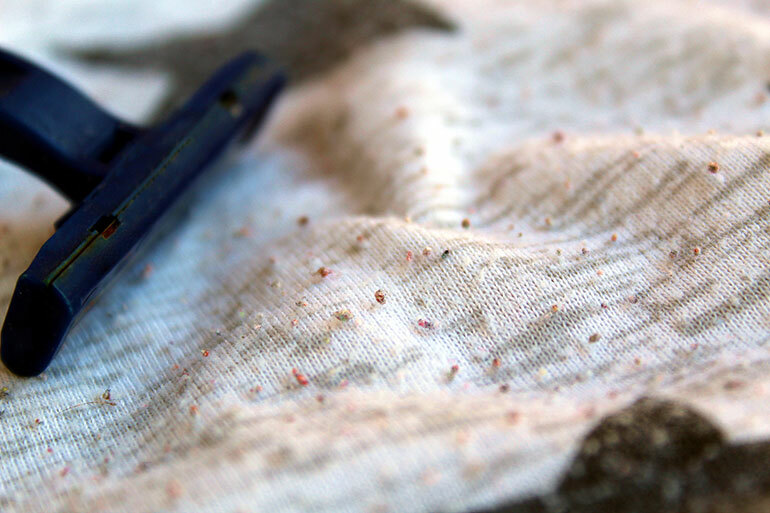 Put that tissue speckled load straight into a clothes dryer to tumble around, letting the lint filter catch all the debris. We can all agree folding EVERYONE’S socks is a complete pain in the proverbial. If you buy one style/colour of everyday socks for each person, it’s SUPER EASY to sort each person’s socks into a pile and upend them into their drawer. No pairing up ever again. Bless. Fold sheets into pillowcases to save time on hunting around the linen cupboard trying to find matching pieces. Sat on chewing gum? Put the pants into the freezer for half an hour then break the gum off. When it comes to drying clothes and stain removal, the SUN is your friend. You’ll be amazed by what stains can be bleached out naturally! A delicates bag (or a bra bag) is not only great for washing delicates but also baby socks, so you NEVER lose them up leg holes again. You can also wash LEGO and other tiny toys in a bra bag through the wash cycle. Genius! A clean razor can be used to remove those annoying pilling balls from fabric. Be careful not to catch the fabric though! Have we inspired you into some kind of cleaning rampage? 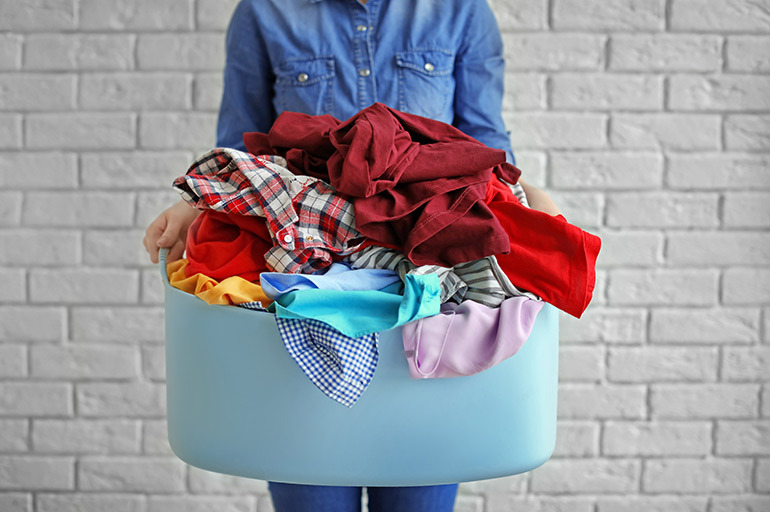 See our bi-carb soda post for LOADS of natural cleaning tips and when you’re done with that, check out these 5 HILARIOUS real-mum tips for decluttering.